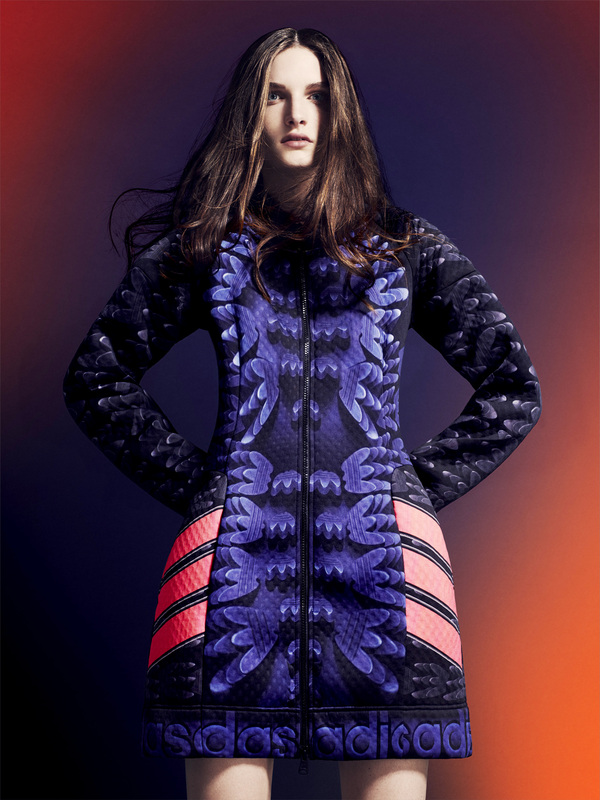 Is it a trainer…or is it a skirt? Trainers are a big deal in fashion right now. HUGE. Not only are they regularly paraded down the catwalk – even at couture shows – but they’ve now made it onto the clothes themselves. So in an unusual post for me, I’m going to look at two designers who have used trainers as their inspiration for dresses, skirts and jackets, rather than actual shoes (don’t worry! There’s a shoe-related post to follow tomorrow). 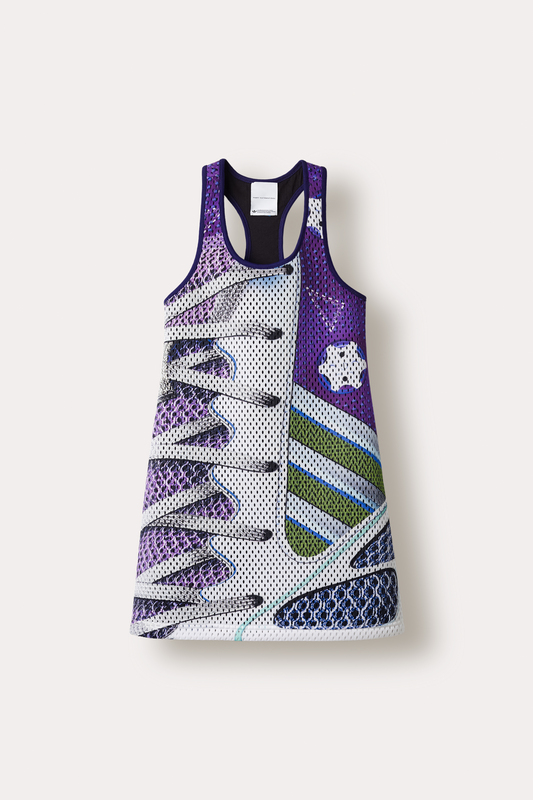 It was announced this week that Mary Katrantzou has designed a capsule collection for adidas (YAY!!). adidas has really been on the money just recently with LOADS of collaborations, including the hilarious Stan Smith (the tennis player the shoe is named after) vs Stan Smith (from American Dad), but this is the one I’m most excited about. 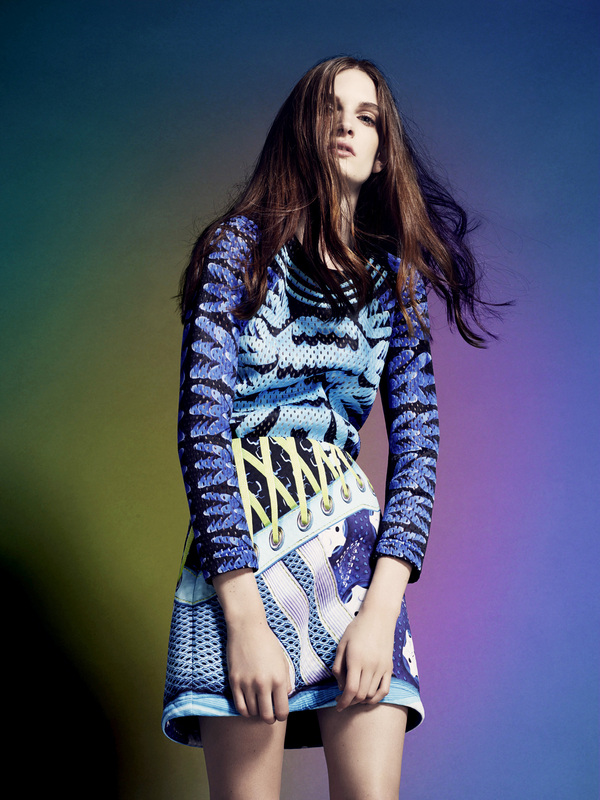 Mary Katrantzou is a favourite on the London fashion week circuit, known for her textured bright prints which are often very literal; she once made a skirt that featured 3D pencils, giving a whole new meaning to the term ‘pencil skirt’. And while her designs are a bit wacky, she still manages to make them totally desirable and wearable. Case in point with the above model shot: this amazing skirt, which as you can see really looks like the lace section of a trainer, would look really cool and not OTT with a plain white T-shirt and a simple pair of trainers (obvs, what else would you wear on your feet?!). There are plenty of actual trainers in this collection too, and I’ll be looking at those tomorrow. It’s available from November 15th and will be a bit more pricey than your average adidas clobber, but you’re still getting a hot designer piece for far less than you’d pay for her main line collection. Result! Another designer using trainers as literal inspiration for his designs is Alexander Wang (he who launches his own collaboration with H&M on November 6th). The dress above, shown at New York Fashion Week in September for the SS15 collections, is, coincidentally, based on the adidas Stan Smith. And once you know that, you can totally see it! There were more dresses based on trainers too, all a little less literal than Mary Katrantzou’s but very clear once you know it’s there. The fabric below is based on the tread on the sole of a trainer.